Source: Received from NetGalley in exchange for an honest review. 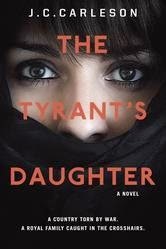 When her father is killed in a coup, 15-year-old Laila flees from the war-torn middle east to a life of exile and anonymity in the U.S. Gradually she adjusts to a new school, new friends, and a new culture, but while Laila sees opportunity in her new life, her mother is focused on the past. She's conspiring with CIA operatives and rebel factions to regain the throne their family lost. Laila can't bear to stand still as an international crisis takes shape around her, but how can one girl stop a conflict that spans generations? This almost felt more like a character study than a novel. It was an incredibly compelling, intimate tale of what happens when 15-year-old Laila, her younger brother and her mom are forced to flee to the US, following her father's death during a coup. Laila's instinct is to try to fit in, to shed the skin of her 'before' life and try to integrate within American teenage society as much as possible. She's very attuned to cultural differences - perhaps partially because they were at the heart of some of the conflicts 'back home.' I found her to be a very canny individual, suddenly very mature and observant as she finds herself forced out of the cocoon-like existence she once led. Laila also has to cope with discovering the truth about her father's regime and the situation in her homeland. There are numerous factions involved, all of which Laila must really learn about quite suddenly. She has a certain innocence despite the horror she's survived, and it's all quite refreshing and heartbreaking and wonderful to read. This is a character that I absolutely wanted to spend more time with. She was compelling in her scrambling to comprehend and to affect her world. I definitely recommend this read. It's an incredibly compelling tale of teenager immigrant with a particularly troubled background, and perhaps even more troubled present. For fans of YA, immigrant stories, compelling teenage experiences, difficult situations. Screen by Michele Renae & A Sale!